The Jacksonville Jaguars utilized yet another strong defensive effort against Cincinnati, knocking off the Bengals, 23-7 in Week 9 of the NFL season. 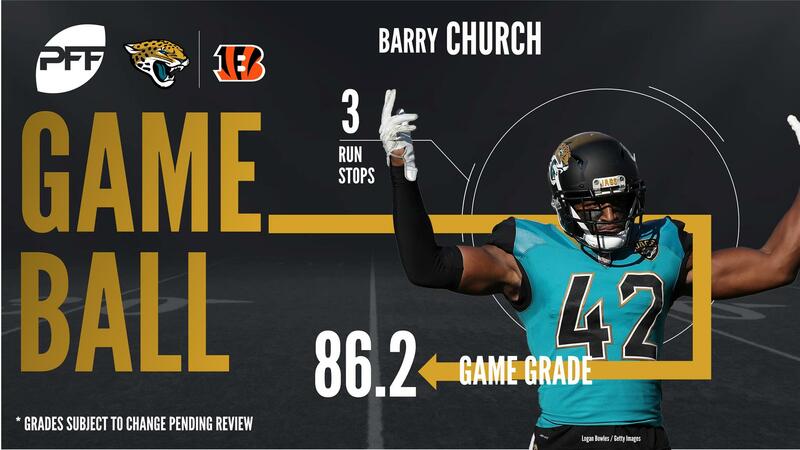 The Jaguars were without the services of star rookie RB Leonard Fournette who was benched due to a violation of team rules, but the Jaguars ‘Teal Curtain’ defense was more than up to the challenge of stopping the Bengals offensive attack. Jacksonville dominated in seemingly every facet, limiting Cincinnati’s offense to just 148 total yards of offense and just eight first downs. The Jaguars offense, on the other hand, gained 407 total yards and 26 first downs, dominating time of possession, 40:14 to 19:46. Numbers aside, this game will be remembered for the fight that broke out on the field when All-Pro wide receiver A.J. Green took down standout cornerback Jalen Ramsey from behind and the teams clashed at midfield. Both Green and Ramsey would be thrown out of the game, and the Bengals offense was stymied in the second half. With that, we give you our PFF exclusive takeaways from the contest for each team. Bortles did a solid job of managing the game in this one. With a comfortable lead for much of the game, all they needed was for him to move the chains on a handful of third downs throughout. Bortles did just that and finished the day with an adjusted completion percentage of 78.8. In his first game back from injury, Linder looked at his best already. He yielded one pressure on the day and was easily the highest-graded run blocker in the game. Church had a solid all-around day, with above average grades in both coverage and run defense. Church registered three run stops on only 17 snaps versus the run and wasn’t targeted once in coverage. The Jaguars newest acquisition didn’t disappoint in his Jacksonville debut. Dareus only played 12 snaps, but in those he notched two run stops. Without A.J. Green for the second half, Dalton was fighting an uphill battle. He missed on all three of his attempts targeted 20-plus yards downfield and the Jaguars were far too stingy in coverage underneath to sustain offense any other way. It was tough sledding for Mixon all day, but he didn’t do much to help himself. Mixon didn’t break a single tackle and averaged only 1.6 yards after contact per attempt. The struggles continue for the Bengals’ big-money corner. He was targeted 11 times on the day and allowed six catches for 93 yards. It was the second time this season he allowed at least 90 yards in a game. Billings’ 48 snaps were the most of his young career on Sunday and the results were mixed. BIllings had a handful of reps where he bench pressED the center back into the offensive backfield, yet had others where he got caught out of his gap.